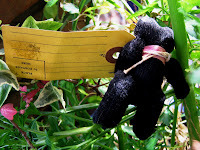 This little black Teddy Bear is American, here is the back of him and as you can see he has a postal tag attached to him. This was meant to be posted exactly as you see him, so you would stamp and address the tag and off he would go. 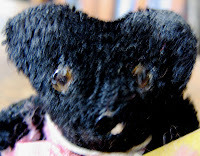 As you can see he has glass eyes and he has a silk plush which covers a hard body, which is probably composition or carton. He dates from the 1930s. 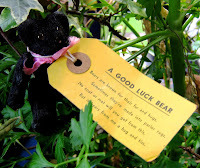 He is fairly rare, very difficult to find in the UK. Perhaps my American friends can tell me if they see them more often on their side of the pond? 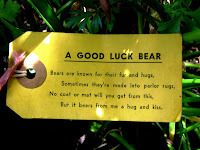 One the reverse of the label says `Bears are known for their fur and hugs; Sometimes they're made into parlour rugs; No coat or mat will you get from this; But it bears from me a hug and kiss'. I think someone should start making similar things today, what a great Valentines gift it would make. This is very interesting. I have not heard of these bears, nor have not seen them here in the US. Cool!